I'm new, so I apologize if this is an age old topic. 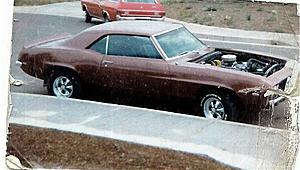 I am looking to put Rally Wheels on my 69 Camaro. Other choice is 15x7x4.25 backspace front & 15x8x4.50 backspace rear wheels with 225/60r15 front & 245/60r15 rear tires. I think I would prefer the staggered look but want to be absolutely certain the rears would be completely tucked inside the rear fenders. A 245 might stick out a little but certainly not much. Not a good pic but this is my old '69 decades ago with G60/14" all around. That's about the same as a 235. 1967 RS with 15" Rally's tires?